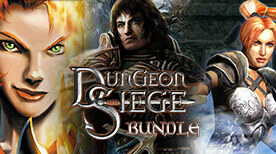 Dungeon Siege® combines the immersive elements of a role-playing game with over-the-top intensity and non-stop action. Dungeon Siege plunges you into a continuous 3D fantasy world where you face off against an army of evil that has been unleashed. A world of adventure where you can explore sprawling landscapes in a seamlessly unfolding story awaits! Players will extend their journey and travel beyond the borders of Ehb to an all-new environment: the Aranoi Desert. On their search for a lost Legion hero, players will fight through hordes of new villains only to find a forgotten abbey hiding a long-lost secret: the greatest treasure of the Azunite faith. Note on Windows 7: Driver version 270.51 or greater is required for Nvidia-based graphics cards. AMD graphics card owners may need to run in Windows XP SP2 compatibility mode.